I was taught to sew when I was about ten, by my mother. I ended up sewing most of my clothes in high school and college. When she passed away, I stopped, despite the fact that I managed to get her next-to-new Viking. I'd never sewn on anything so grand. It's a serger, huge and computerized and totally intimidating. The idea of four threads at once totally put the fear into me. 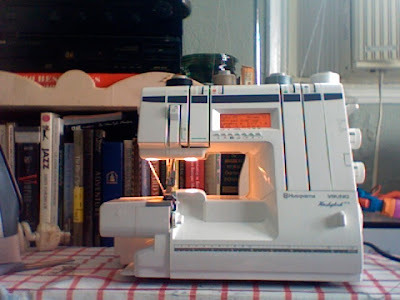 The Viking sat in our living room, where I would shoot longing glances at it while pulling fabric through my tiny Shark Euro-Pro. It was too big and too crazy for little ol' me! At Christmas, Ben surprised me with a serger lesson from the local sewing studio, Common Thread, in South Pasadena. I was finally ready. I registered and hauled my machine in last Saturday. As a serger novice, my trepidation was with the threading. I was relieved that most of our time would be focused on this. Our instructor, Rebecca, patiently took us through a tour of each of our machines, so that we could see what path each thread takes. That thing is a beast. I was completely fascinated. I expected Rebecca to tell me that I'd need to get the machine serviced--after all, it had been three big years of not being used at all and battling through move after move. After some threading education, the thing worked like a charm. I was overjoyed! Visions of yellow dresses and matching bags danced in my head, coupled by the idea that I could make this pairing in an afternoon. Time saving and good looking! There might not be a better combination. My mind was blown when I learned about using my differential feed. I never knew this option existed in the first place! A differential feed gathers or loosens the fabric as it is fed through the machine. Another huge time saver! I've spent so much time manually gathering fabric, pinning it in place, and then sewing it up. I'm going to plan patterns around this little dial. This was such a thoughtful, sweet gift, and I know that the things I picked up in the two and a half hour class will be used over and over again. I'm so grateful that my mother taught me how to sew initially, and now I can go next levs with it. I actually exclaimed during the lesson, "I'm going to make so many things!" Hey Aurora! It's Charissa from Common Thread. I was the one who spoke w/ you on the phone to get your registered for the class. So glad you liked it! Definitely send us pix of what you make - I'm looking to feature more customer stories on our blog.